Picklets 1.1 is now live in the App Store in Canada, US, UK, EU countries and Switzerland in addition to Australia and New Zealand. The Picklets app is a free download. The 3 Baddest Bandits of the Wild Wild West by Ben Hutchings and Mummy in the house! by Peter Nishitani are available for in-app purchase at $0.99 (Canada, US, Australia), £0.69 in the UK, €0.79 in Europe or CHF1.00 in Switzerland. 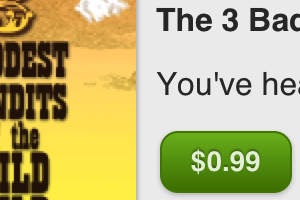 You can read a fully interactive sample of these picklets in the app before you download or pay for anything. How good is that? The price of content will also drop to $0.99 (that’s the Australian price, at least) and for the first time the app will be available in US and UK App Stores (plus others). So it will be properly launched. Which is quite exciting for me. I’ve been working on a new feature in the Picklets app which makes it easy to swipe quickly through all the panels of a picklet – from the cover to author bio. It’s not finished, but I like showing things that aren’t finished. There are so many of them to choose from. Yesterday I noticed that the Picklet Store previews weren’t working. It’s happened before that my in-progress back-end development deployment breaks the current version of the Picklets app. A real engineer would have a) unit test coverage to catch the regression, b) monitoring of the live server that flags the service failure or c) both of the above. I have d) none of these, because I am not an engineer. I am a Software Artist, goddammit. But it’s fixed now, so that’s cool, right? On the off-chance that someone out there on the internet downloaded the Picklets app last week, tried to preview ‘bandits’ or ‘mummy’ noticed the failure and was curious enough about it to track down this blog, I’d like to apologise and kindly ask that they try it again, because it’s working. For now. I broke it when I pushed some changes relating to what I call ‘fullsize’ content, which is part of the next release of the Picklets app. Which app will have a lovely new iPad interface, and be just generally a better picklet reading experience. The images look sweet. I can’t wait. Could we lose more than just the feel and smell of a book as we move to reading digitally? Have you considered what will happen to the traditions of pop-up books, comics and children’s picture books in the digital world? 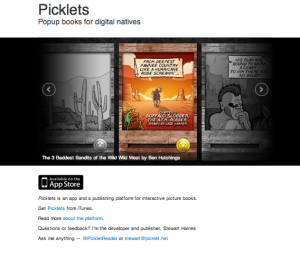 Picklets is an e-publishing platform for interactive picture books that blends reading and animation to replicate these much-loved book forms for digital natives. Here’s the pdf version of the full Picklets Press Release. My thanks to @McFifi for driving it.